This replacement ribbon cable can be used to fix pixel display problems (missing, faded, and dark pixels) in the MID (Multi-Information Display) Radio Display for select BMW and Range Rover vehicles. The ribbon should be installed by an experienced professional using a 30-Watt soldering iron, T-Tip adapter head and rubber cable. Installation instructions are not included with the ribbon. The ribbon cable is compatible for usage in BMW 5 Series 530,528,540,M5 (E39) 1996-2003; 7 Series 740,750 (E38) 1996-2001; X5 Series (E53) 1999-2006 as well as Range Rover 2003-2005. 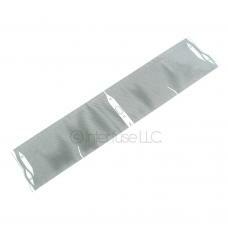 Replacement pixel display ribbon for usage in select BMW and Range Rover vehicles. The ribbon can help to fix dispaly problems including missing pixels, faded pixels or dark pixels. The ribbon should be installed by an experienced professional. A 30-Watt soldering iron, T-Tip adapter head and rubber cable is required for installation however not included.